A few weeks ago, my friend Joan took me, as a birthday treat, to Indulgence Edmonton, a fantastic local food event meant to showcase local food producers and local chefs. For a cheap-as-chips $45, you get to sample small plates of all sorts of really great locally grown and locally prepared foods. You know the phrase, "we drank our faces off". Well, we didn't exactly drink our faces off. We ate our faces off. One of the things that I really enjoyed was Patrick Turcot's Zucchini Soup. Luckily, Mr. Turcot, the executive chef at the Fairmont Hotel MacDonald, had a stash of printed recipes on hand and kindly obliged me by permitting me to reprint it on my web site. This dish would make a stunning first course or lunch dish. The soup would also be great on its own. It's velvety smooth and thick enough to hold the scrambled duck eggs and confit on its surface, so quite substantial. The zucchini taste is lovely and mild. Also, it's not as difficult as it looks. The soup is a breeze to make and anyone can scramble an egg (use good free-range hens eggs if you can't find duck eggs) and fry some leeks. The only tricky part is the confit, but since I recently provided a recipe for "Cheater's Confit" you don't really have an excuse, do you? I tweaked the recipe a tiny bit by using the bones and skin from the duck confit to make a small amount of duck broth, which I used to replace about half the chicken stock. Melt the butter in a large stockpot over medium heat. Add the onions, garlic, salt, and pepper and saute for 2 minutes, or until the onions are tender and lightly caramelized. While the onions are cooking, peel and slice the zucchini. 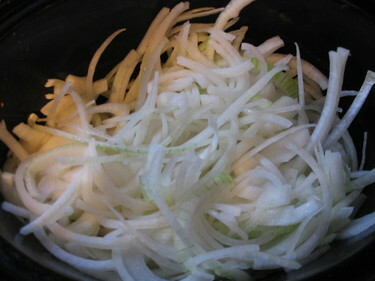 Deglaze the onion mixture with the wine and then add the zucchini, potato and chicken stock and bring to a boil. Reduce the heat and simmer covered for 20 minutes, or until the zucchini is tender. Puree in batches in a food processor or blender until smooth. Return to the saucepan and simmer until the soup is thick and hot. For the garnish, saute the leek in olive oil until tender then mix the leeks with the duck confit. Set the confit and leek mixture aside. Beat the duck eggs with a fork and cook to a soft scramble stage. 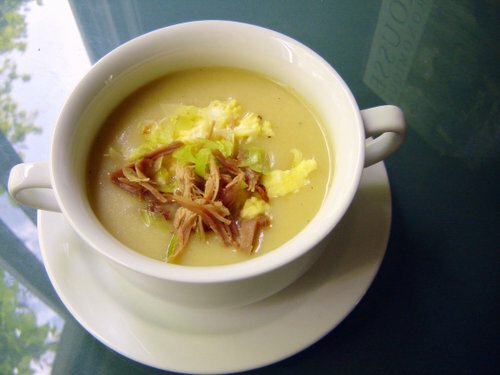 Adjust the salt and pepper if needed and serve the soup hot with a garnish of duck confit and scrambled egg. This really easy and light-tasting soup is the first Thai dish I learnt to make on my first trip to Thailand in August 2000. It's also probably the only Thai soup that isn't hot and spicy. Thanks to the garlic, coriander and beansprouts, it really highlights the fresh and light taste that characterizes Thai food, without the usual heat. If you can bear to eat a Thai meal without adding a few peppers, be my guest! I usually make a large quantity of the meatballs and freeze them raw in a plastic baggie. Having them on hand that way make this soup even easier: 5 minutes from start to finish! 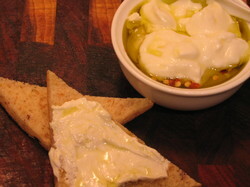 It's make a great first course to a heavier meal because it's so light ans refreshing. 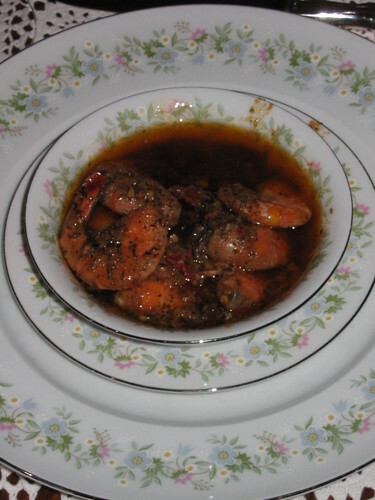 The recipe below is adapted from the recipe given to me at the Chiang Mai Thai Cookery School by Sompon Nabnian, the proprietor of the school. If you can't find coriander root, you can use the stems, finely chopped, but increase the amount to 4 tablespoons. 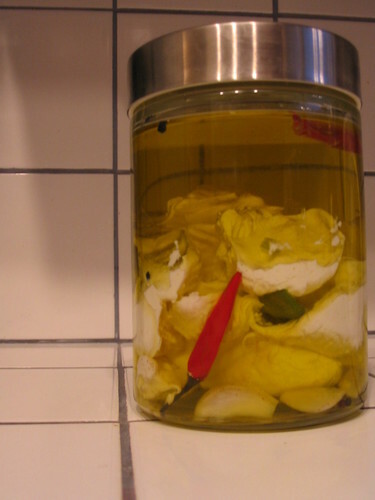 Glass noodles are also called bean thread. You should be able to find them in any Chinese grocery store. You will need to soak them for a few minutes in hot tap water and then use kitchen scissors to cut them into smaller pieces. After that, drain them and they are ready to use in your soup recipe. Mix the pork, coriander root or stem and garlic together with your hands until very well Separate the mixture into tiny meatballs, about the size of a small grape - you should be able to make approximately 48. Set aside. Put the stock into a pan and bring to the boil. Add the meat balls and cook for 2 minutes. Turn down the heat to medium-low, then add the shredded Chinese cabbage and tofu and simmer gently for another two minutes. Add the soaked glass noodles followed by the light soy sauce and fish sauce. Ladle into 6 bowls and garnish each with coriander leaves and spring onions. I know it looks like carrot soup, but trust me, it isn't. I made it with organic orange peppers (capsicum). 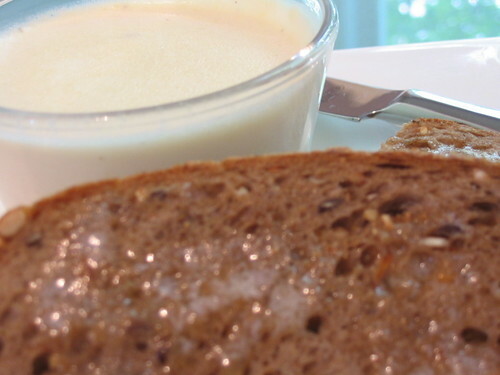 I have a standard recipe I use for creamy vegetable soups. I first made it in tenth grade (1987 for you math buffs out there!) and I love this recipe, although the circumstances under which I discovered it were, to my young mind, profoundly tragic. In fact, I thought it was the end of the world. I was doomed to a life of misery. 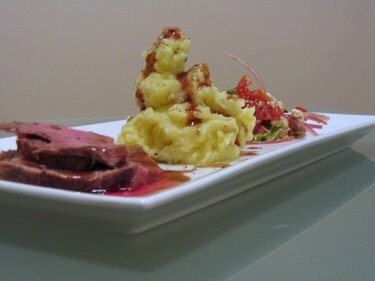 I'd invited two of my closest girlfriends over for a sleepover on a Saturday night and I wanted to make a special supper for them. Mum sat me down with a bunch of cookbooks and magazines to pore through, but the recipes I wanted to use came out of an advertisement for the Canadian Butter Association in Reader's Digest. Each of the recipes: Golden carrot soup, pan fried white fish and caramelised oranges with ice cream, featured, in a central role...you guessed it, butter. I seem to recall my mother scanning over the recipes and proclaiming that, all together they called for a pound of butter. She asked whether I really wanted to make them and I said yes. So I did. My 14 year-old self couldn't have cared less about eating a pound of butter. I cooked and cooked and chopped and stirred all day Saturday. Ceri and Jennifer were supposed to come over at six pm. At six thirty there were not still there. Nor were they at seven. I finally called Ceri's house. They weren't there. I called Jennifer's house. Jennifer came to the phone and told me in the nasty, cruel manner employed only by 14 year-old girls and certain bitter celebrities, that they had decided that three was too many people to be friends and that they were not interested in being mine any more and so would not be coming over. My little heart was crushed. I cried for days. The soup was damn good though. Still is. Although the original recipe called for carrots, I make it with far less butter these days. I may have much more stable 30-year old friends now, but alas, less of a 14-year old's metabolism. I use the same basic recipe for any vegetable cream soup - asparagus, capsicum (bell pepper), fresh garden peas, mushroom, zucchini - the list could go on interminably. I vary the seasonings and spices as well: dried cumin and fresh corriander with the carrot, dill and a bit of fetta with the capsicum... I also occasionally throw in some extra wild rice (as here), or barley or something after the pureeing stage if I want something a little more filling. Melt butter in a large (about 4-5 litres) heavy-bottomed saucepan. Cook and stir onions and garlic in melted butter until soft and slightly browned. add the remaining ingredients, excpet the fresh parsley and wild rice. 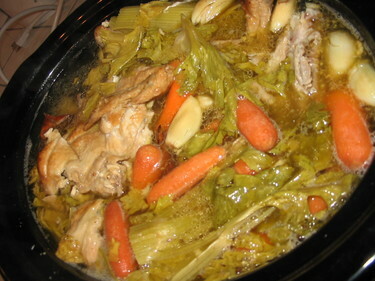 Bring to a biol, cover, reduce heat and simmer for 35 minutes, or until vegetables are very tender. Use an immersion blender to puree the contents of the pot. If you don't have an immersion blender, you can do this in a regular blender, but be sure to do it in very small batches and remeber to keep your hand very firmly on the lid. If you fill the blender more than 1/4 full, or forget to press down on the lid, the contents will probably blow the lid off and you will end up with scorching hot pureed vegetable all over yourself and your ceiling. Once the soup is pureed, add the parsley and briefly pulse the blender (whichever kind you happen to be using) to cop the parsley more finely into the soup, but no not allow it to puree, or it will make your soup an unappetizing muddy green colour. Add the cooked wild rice. 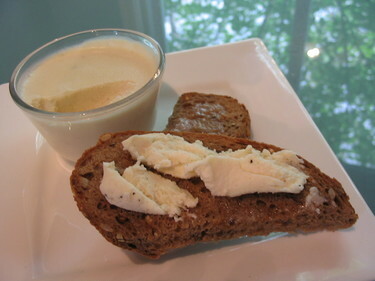 Serve with a dollp of cream, sour cream, buttermilk or creme fraiche...or just by itself. After so many weekends where I have hardly had time to make toast, I finally had a chance to redeem myself this weekend. Whenever I can spend a whole weekend cooking, I feel like I've accomplished something worthwhile. Not that the other things I do aren't worthwhile...I just get a deep feeling of satisfaction from cooking. Chapter Two: Whole wheat bread - From my mother's recipe that she wrote out on a 4x6 index card for me when I went away for my first year of uni in 1990. 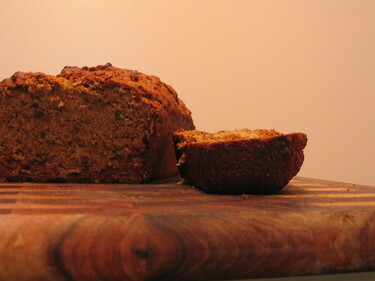 Chapter Three: Banana bread - From straight out of my head. I basically chucked some stuff into a bowl. One of Cake's stock jobs in the kitchen involves mashing bananas with the potato masher as he knows it will lead to hot banana bread within an hour. I've never been a big fan of bananas in any form, but this is one of Cake's favourites, so it gets made a fair bit in our house. My recipe, if it can be called such, involves 3 to 6 riperiperipe bananas, 2 eggs, a splash of oil (I'm guessing somewhere between 1/4 and a 1/3 of a cup), a hefty dose of vanilla, cardamom, cinnamon, nutmeg (all fresh ground), brown sugar (a cup and a half or so, sometimes split half and half with white sugar), orange blossom water, toasted pistachio nuts or hazelnuts or pecans, a chopped soft pear, baking soda (4 teaspoons), baking powder (1 teaspoon) and enough whole wheat cake flour to make a dough that is marginally wetter than a drop-scone consistency. I bake it at around 350 until it's brown on top and a knife comes out clean. I pull it from the oven, cut 2 thick slices, lavish them with butter and present them to Cakes. 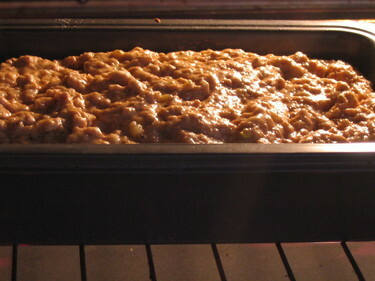 Although this recipe makes an enormous loaf (I use oversize pans) it's usually gone within 12 hours. Chapter Four: homemade chicken stock - Having learnt my lesson about stock on the stove (which is that I am too scattered to be trusted with a $300 stockpot a duck carcass and a stove)...plus I don't have a stockpot anymore (also part of learning that particular lesson). I bunged two roasted chicken carcasses with plenty of meat left on and the onion wedges caramelized from roasting still shoved up their bottoms, a handful of organic baby carrots, a few ribs celery, lots of garlic, fresh parsley, a bay leaf, sea salt, cracked pepper, an additional onion, halved in my slow cooker on high with water to cover and left to cook for the better part of 18 hours, adding water as necessary. Amazing. It has been magically transformed into cubes in my freezer and awaits its next incarnation. 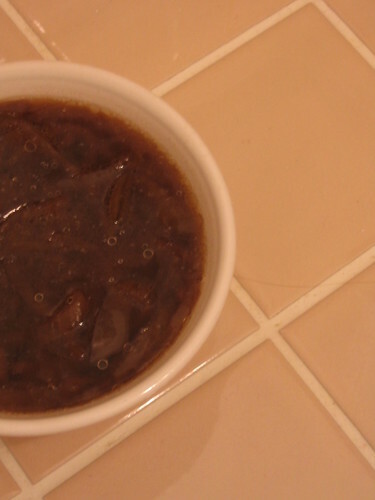 Chapter Five: Three onion and Merlot soup - Another slow cooker success. 3 huge sweet onions, 1 purple onion and one sharp yellow onion plus a giant knob of butter in my slow cooker on high for 4 hours, stirring occasionally, after which I added the better part of half the contents of a bottle of nice Merlot and a bit of beef broth. I let is burble away in the cooker for 10 hours. How simple is that? There's no need to watch it the way you have to on the stove (especially if you're like me and you get impatient and try to turn the heat up in an effort to get it done faster!) and the onions are gently caramelized and lovely by the end. 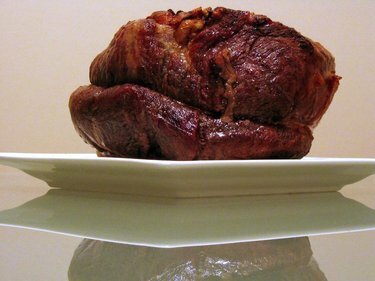 Chapter Six: Roast beef - As an example of how food-oriented my family is, I got a gorgeous big roast of beef in my Christmas stocking. My mum made these enormous stockings for us one Christmas, and this roast damn near filled it up. Well, that and the little farting Santa doll. I always use Nigella Lawson's cooking times for roasts, because they are fool-proof. Although, this time, I increased the heat a little (see above re: impatience) and the beef came out a little less moo-ey than I normally like. Cakes and I are rare meat eaters, so unless it still moos when prodded firmly, it's too well done for us. That said, it was nice anyway. I cut little pockets in the meat and slid in some cloves of garlic, which always helps. Otherwise, I rubbed it with a little oil and left it alone. I poured the rest of the Merlot in the pan with a bit of beef broth and left some garlic cloves to roast in there. It made the nicest, darkest richest gravy. I caught Cakes drinking it from the gravy bowl after he offered to clean up the kitchen. Sneaky Cakes. When he left the kitchen in disgrace, I had a drink too. 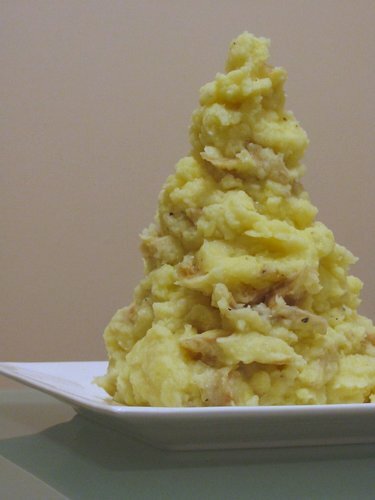 Chapter Seven: Smashed potatoes - Need I say more? gorgeous yellowy, skin-on potatoes with cream, buttermilk, butter, salt and pepper. Nothing else. Yum. I used a fair bit more liquid than I usually would, and the potatoes came out beautifully light and mouss-ey. I think that had partly to do with my use of Yukon gold rather than my traditional russet. I may just have switched potato teams for good!! 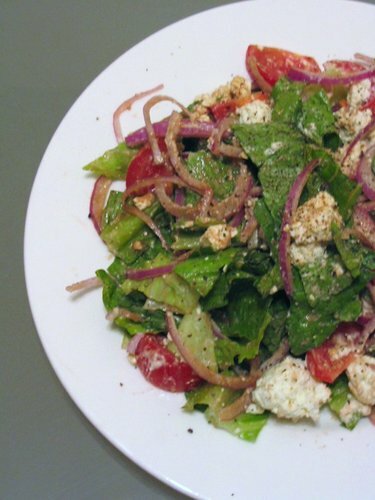 Chapter Eight: A really nice salad of creeeeaaaaamy Bulgarian feta, crisp romaine, red onion, campari tomato, a squeeze of lemon and the tiniest splash of balsamic. And cracked pepper.